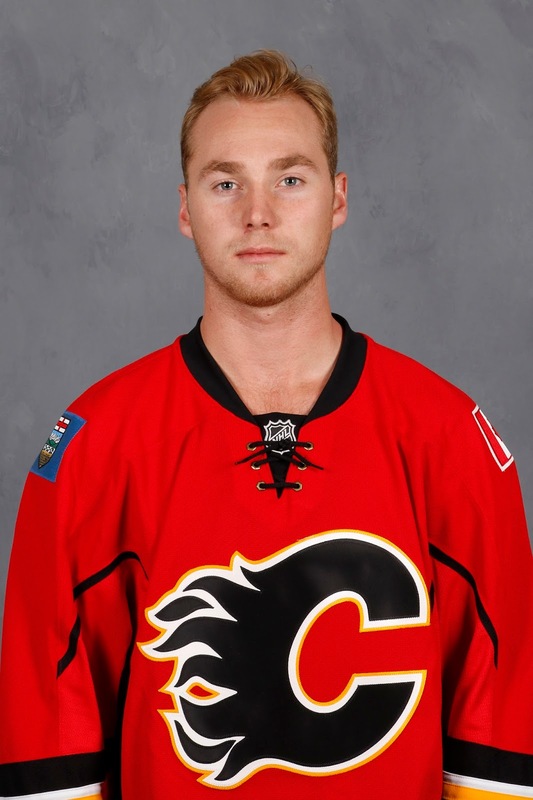 Where were you watching the game the night Sam Bennett scored four goals as a rookie? For the passionate Calgary Flames fan, Wednesday at the Scotiabank Saddledome was a very rare and special night. It was one of those truly magical and memorable 'time and place' games where you'll always remember where you were because of the significance of what unfolded, especially considering the circumstances leading up to it. The NHL came into existence in 1917-18. Last night, on an unseasonably warm winter evening in Calgary, Bennett became the third-youngest player in league history to score four goals in a game. A first period hat-trick then a slick dipsy-doodle individual effort with 25 seconds left to put an exclamation mark on a 6-0 shutout of the red-hot Florida Panthers. Third-youngest player in 99 years to score four goals. 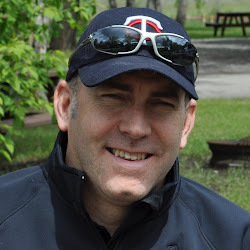 Bob Hartley summed it up in one word last night after the game and I'll echo it again today. Wow! The night in 1989 when Lanny McDonald scored and Calgary hoisted its first Stanley Cup. The night in 1986 when Steve Smith banked the puck into his own net off Grant Fuhr. The night in 2004 when Martin Gelinas scored in overtime to eliminate the Canucks. The night in 2004 when Gelinas' appeared to have scored the potential Cup-winning goal. Yes, it was that kind of feel-good evening for the city and fans of this hockey team. To be in the building was incredible from the barrage of hats sent flying at 17:01 of the first period to the boisterous chanting of Bennett's name after he took his spin as the game's first star then charmed the crowd with his on-ice interview with Ryan Leslie. The fans stood and cheers and just couldn't get enough. They wanted an encore appearance as if it was the end of a rock concert at Madison Square Garden and No. 93 was Bruce Springsteen. If you're of my vintage, somewhere in your house, you own an old dilapidated shoe box full of keepsakes accrued from over the years. Oh, there is some bizarre stuff hidden inside there and I'd be lying if after 40-plus years, I could tell you the exact story behind each of the items in mine, but there are a lot of tickets to sports events -- all of some significance. If you were one of the 18,702 fortunate enough to be in attendance at the Scotiabank Saddledome, that was a game you will always remember, not that anyone saw it coming. The Flames, losers of four of their previous five at home. Florida came in as the hottest team in the NHL on a 12-0-1 run. Seriously, the Panthers on a Wednesday in mid-January is probably one of the last ducats to go when those of you sharing season tickets conduct your draft to divide up the games. Instead, those in attendance were given a treat. No longer will the night of the streaker in 1998 be the most memorable Panthers-Flames game. What you do next is print the NHL game summary as the specifics will get fuzzy over time -- that's how our memories work, attach it to your ticket stub and slip them in that shoe box. You'll be glad you did. To put Bennett in his rightful place in NHL history, this morning I revisited the big nights for the two players -- Jackie Hamilton and Bobby Carpenter -- who scored four goals at age 18. It's an an interesting and nostalgic journey through NHL history filled with an interesting anecdote or two along the way and a few familiar names. If you haven't heard of Jackie Hamilton, you're forgiven. The native of Trenton, Ontario, broke into the six-team NHL at age 17. 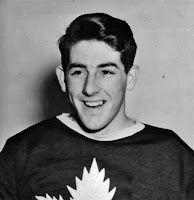 He joined the Maple Leafs from the Toronto Staffords junior team midway through the 1942-43 season. Hamilton played 13 NHL games that season. His historic night came the next season. On a Saturday night before 9,359 fans at Maple Leaf Gardens, Hamilton -- on a line with Jack McLean and Tom 'Windy' O'Neill -- scored four goals and had an assist against the hapless New York Rangers in an 11-4 win. It kept New York winless on the season at 0-12-1 (strikingly similar but in polar opposite form to Florida's streak coming into last night's game). Hamilton scored the game's second goal at 14:47 as Toronto took a 3-0 lead after the first period. His other three goals came in the second as the Leafs responded to an early Rangers goal by scoring five straight to open up an 8-1 lead. Hamilton made it 4-1 at 6:35. After Gus Bodnar scored unassisted at 8:44, Hamilton scored again at 12:53 and once more at 14:14. Hamilton went on to finish that season with 20 goals in 49 games. After one year with Cornwallis in the Canadian Navy League, he returned to the NHL but only played one more season, scoring seven goals in 40 games for the Maple Leafs in 1945-46. He played pro hockey for the next several years and appeared in various leagues but never again in the NHL. His final totals with the Maple Leafs, were a modest 28 goals and 32 assists in 102 games. The 1943-44 season was the first in which the NHL had a centre ice red line. Both teams that night dressed 13 players -- 12 skaters and a goalie. This was the norm back then. Hamilton held the distinction of being the youngest NHL player to score a hat-trick until Jordan Staal (18 years, 153 days) on Feb. 10, 2007, in Pittsburgh's 6-5 win over Toronto. The Rangers were a bad team. They finished that season in last at 6-39-5 with goaltender Ken McAuley in net for all 50 games. He had a 6.24 goals-against average. 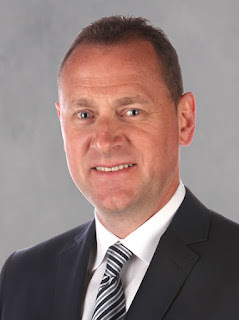 Bobby Carpenter was drafted third overall in the 1981 NHL Entry Draft out of St. John's Prep in Danvers, Massachusetts. That year, Winnipeg selected Dale Hawerchuk first overall and Los Angeles chose Doug Smith at No. 2. Carpenter went one ahead of Ron Francis. He broke into the NHL that season playing in all 80 games. His historic game came on a Thursday night in front of a small crowd of 8,740 at the Capital Center in Landover, Maryland. 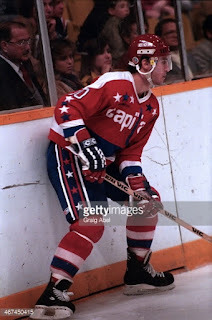 Washington peppered St. Louis goalie Mike Liut with 46 shots in a 9-1 win. It was the ninth loss in 10 games for the scuffling Blues. St. Louis actually led 1-0 after the first period before Washington took over. The Capitals were up 3-1 when Carpenter scored his first at 13:51 of the second. It would be the first of three straight tallies as he would score goals 25 seconds apart in the opening minute of the third. His fourth goal came with 2:22 left in the game and made it 8-1. Carpenter scored 32 goals and had 67 assists in his rookie season. For his career, which also featured time with the New York Rangers, Los Angeles, Boston and New Jersey before retiring at age 37, he finished with 320 goals and 728 points in 1,178 games. The NHL consisted of 21 teams back then. Washington finished last in the Patrick Division that year and was one of five teams to miss the playoffs. Carpenter also had a fight that night with Jim Nill, now the GM of the Dallas Stars. His linemates for his big night were frequent linemate Mike Gartner and Lou Franceschetti. Assisting on two of his goals was defenceman and longtime NHL head coach Terry Murray. We'll never know whether Bennett would have made the Flames as an 18-year-old. When a shoulder injury was identified late in training camp last year, he was shut down. Eventually he had surgery and he missed three-quarters of the season before returning to health late in the year. At that point -- with the NHL in overdrive -- he was assigned to Kingston of the OHL where he finished the regular season. 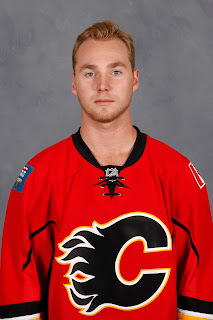 After the Frontenacs first round playoff exit, Bennett re-joined the Flames in time to get in the line-up for the regular season finale and -- despite it burning the first year of his entry level contract -- he played in all 11 of Calgary's playoff games. The storyline this season was his 18-game, 47-day scoring drought, which he finally snapped on Monday in Calgary's 5-4 loss to San Jose. 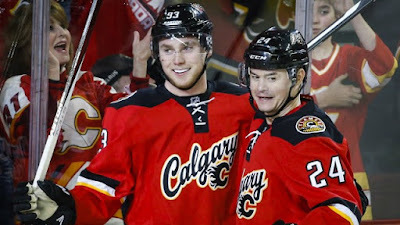 It's been a long time since I recall a Flames player being so good, while also being so snake-bitten around the net that he ended up with absolutely zero to show for it. After scoring that powerplay goal against the Sharks, Bennett caught everyone's attention when he amusingly made the gesture of removing a monkey off his back. Turns out that monkey is, indeed, long gone. First was the one-timer of Jiri Hudler's pass to open the scoring 56 seconds into Wednesday's game. His second came when as he sliced through the Florida defence and burst in on net, and had the puck slide off his stick on an attempted deke and slip under Roberto Luongo and into the net. After the game when asked what he can be seen saying to Mikael Backlund afterwards, Bennett laughed and said he just told him that's what he meant to do. The third, wrapping up the first period hat-trick came on a Deryk Engelland rebound, as he deftly tucked the puck under the crossbar from in-tight -- the consummate goal-scorer's goal. Then there was the finale at 19:35. A dandy dangle around Alex Petrovic and a perfect finish -- in every sense. The list of Bennett's accomplishments was long and kept the folk sat Elias Sports working long into the night. Individual accolades aside, it was an important victory for the team as Calgary tries to climb back into a playoff spot in the Pacific Division. Heading out on a five-game road trip, the Flames do so feeling good about their current top-six up front that will make them a more formidable team to defend then when Calgary had just the top line going, which has been the case most of the year. Micheal Ferland continues to look good on the right side with Johnny Gaudreau and Sean Monahan. Don't expect any changes to the Bennett line that featured Backlund at centre and Hudler on the right side. Plus, Michael Frolik's looming return will give solidify Calgary's third line, regardless of who else ends up on it. Perhaps the left-shooting Frolik switches to the left wing and lines up with Markus Granlund and David Jones. We'll see on Friday. 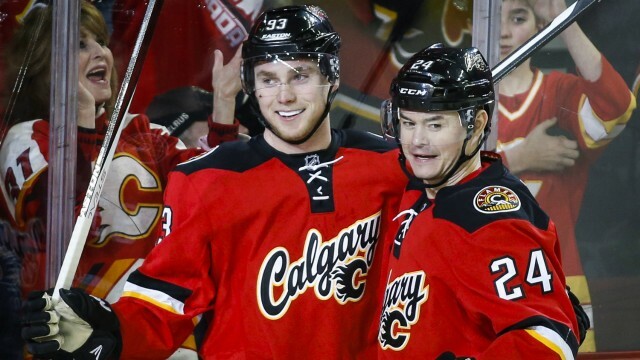 The Flames were given the day off Thursday as Hartley figured they earned it. Most intriguing is what's next for Bennett. You sure get the feeling it's not a matter of if he'll score any goals on this road trip that also features stops in New Jersey, Columbus, Carolina and Dallas, but more a case of how many. It should be fun to watch, probably not 'time and place' calibre of fun like last night as those are rare, but still entertaining nonetheles. For those watching as fans or covering this team as a profession, that's all anyone can ask.